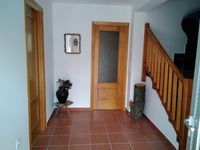 Properties in Villanueva de Ávila average 4.7 out of 5 stars. Casa la Salamanquesa in the heart of the Tietar Valley. Property 17: Casa la Salamanquesa in the heart of the Tietar Valley. Vaho (Apart 2) Apartment at the foot of the garden. Property 21: Vaho (Apart 2) Apartment at the foot of the garden. Nuñocojo (Apart 1) Apartment at the foot of the garden. Property 37: Nuñocojo (Apart 1) Apartment at the foot of the garden. Quiet house in an idyllic location Near the Parador de Gredos in the sierra paz. Property 46: Quiet house in an idyllic location Near the Parador de Gredos in the sierra paz. Casa acogedora. Trato exquisito por parte de los propietarios. Muy buena experiencia.